Champion 4500 replaced with 145 Welder/Generator for maintenance and repair projects. 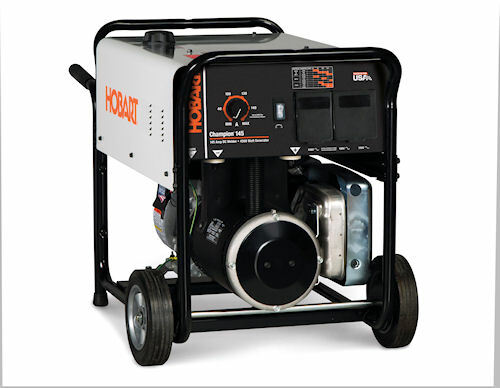 Hobart Welding Products replaced its Champion 4500 welder/generator with the new Champion 145 recently, adding a 6.25 gallon fuel tank to the machine – in place of the one-gallon tank on the previous model. The new fuel capacity gives the 145 12.5 hours of run time welding at 75 amps, or cranking out 2,500 watts of 240 VAC and 120 VAC power. The 145 boasts 4,500 watts of surge power for starting various motors on the job site. The control panel features four 120 VAC receptacles and one 240 VAC outlet, all with covers. The machine provides up to 145 amps of DC welding power for stick electrodes up to 5/32 inch and features circuitry that allows exceptionally smooth arc-starts. Champion 145 has larger fuel tank than its predecessor to give longer run times as welder and backup generator. The Champion 145 weighs in at 235 pounds and includes a roll bar frame and wheels for mobility. For more information on the Champion 145 and its 5/3/1 warranty, visit www.hobartwelders.com, or call (800) 626-9420.